Table of Contents Next: Wedemeyer, Albert C.
Military operations in the Second World War were strongly affected by the weather, as military operations have been since antiquity. Weather follows regional patterns that are reasonably predictable over the long term. Short-term variability in weather can be reliably predicted only on the basis of scientific observations over a network of stations. In peacetime, such observations are shared internationally; in time of war, the data from enemy weather stations are no longer available. Both sides made use of submarines to collect weather observations from the other’s territory. The United States also converted a number of frigates to weather ships. In addition, the United States Navy established a station in Outer Mongolia to obtain information for central Asia. The weather detachment was guarded by Chinese troops who carried out a significant guerrilla campaign against the Japanese on the side. The weather patterns of a region depend on latitude and geography. In the northernmost parts of the Pacific basin, near the Kuriles and Aleutians, warm air from the Kuroshio Current, the Pacific equivalent of the Gulf Stream, meets cold air from the Bering Sea and Siberia. This produces a storm belt, with disturbances passing though every few days most of the year. Further south, at latitudes of 45° characteristic of northern Japan or Seattle, the weather is dominated by the westerlies. Storms are relatively infrequent at this latitude in the Pacific. Over the continents, during the winter months, the northern storm track is located further south, and winter storms occur every few days. During the summer, the track moves further north, and weather is more settled. Yet further south, at latitudes of 30° characteristic of San Diego, there is a dry belt, sometimes known as the horse latitudes, where winds are very mild and rainfall very infrequent. This corresponds to most of the desert regions of the Northern Hemisphere. At latitudes of 15°, characteristic of the Philippines or Hawaii, the weather is dominated by trade winds from the northeast. This is the latitude at which most tropical cyclones reach full strength. At a latitude of 5° (in summer), one encounters the Intertropical Convergence Zone, sometimes known as the doldrums. The ITCZ is a region of overcast and light surface winds, except in the vicinity of towering thunderstorms, which produce strong local wind gusts. This region shifts closer to the Equator during winter in the Northern Hemisphere. It is located just north of the Solomon Islands and New Guinea and was something of a terror to airmen of both sides, as it produced very dangerous flying weather. Further south, the weather patterns are nearly a mirror image of those in the Northern Hemisphere. Land masses have a strong perturbing effect on these weather zones. The most significant is the monsoon, which dominates weather patterns in south and southeast Asia. The Andes Mountains of South America tend to enhance the dry belt of the southern horse latitudes, and modern satellite photos show a long triangular dry region extending from the Atacama Desert of South American far westward over the Pacific. The ITCZ becomes very ill-defined west of New Guinea, where numerous large islands act as heat sources or sinks. Australia is a pathway for cool, dry air to move northeast as cold fronts crossing the Coral Sea. Orogenic thunderstorms are thunderstorms that form over mountains due to solar heating of their upper slopes. Thunderstorms likewise tended to form over islands in the deep ocean basins. Weather often determined whether operations could take place. The Japanese schedule for the Centrifugal Offensive was determined, in part, by concerns that the winter monsoon would set in and multiply the difficulties of the many landings required. Likewise, the Tarawa landings took place, in spite of uncertainties regarding the tides, because a further delay might mean westerly winds would set in and make the landings impossible. Bad weather could be particularly disastrous for air missions. For example, on 1 June 1945, a formation of B-29 Superfortresses encountered a severe thunderstorm and turbulence. One of the Superfortresses attempted to change course, along with its escorting Mustangs, and ran headlong into the formation behind it. Some 27 aircraft and 24 pilots were lost, a much higher number of casualties than were typically inflicted by enemy action at this point in the war. Jet streams proved a serious difficulty for B-29s over Japan. These are narrow regions of high wind located at high altitude (above 25,000 feet or 7600 meters) that can sometimes reach velocities exceeding 200 miles per hour (320 km/hr). Weather could also provide cover for aircraft. 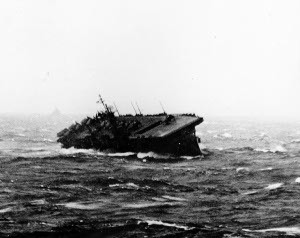 Allied sailors in the western Pacific in 1945 referred to the regular pattern of afternoon and evening rain squalls, caused by solar heating during hte day, as "kamikaze weather" because it could mask the approach of hostile aircraft.